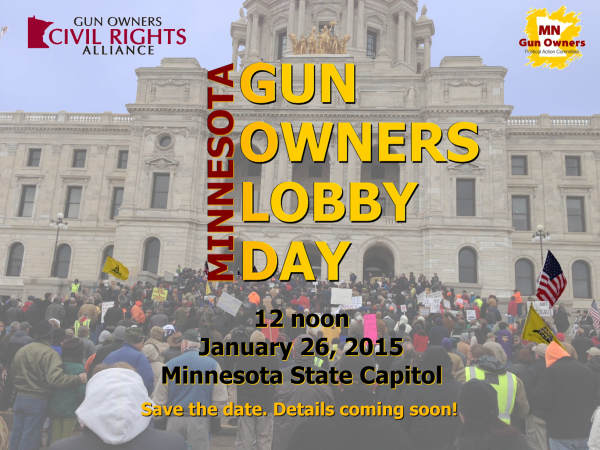 On Monday, January 26th, Minnesota’s gun owners will converge on the Minnesota State Capitol for the first annual Minnesota Gun Owners Lobby Day (MNGOLD). We will show our strength with a rally outside the capitol, then march inside to meet with every single legislator in the state. In the capitol, we’ll deliver a strong message: you work for us, and it’s time for you to respect, protect, and advance our Second Amendment rights. The event is co-sponsored by Gun Owners Civil Rights Alliance and Minnesota Gun Owners Political Action Committee. The organizations will be releasing more information about the event next week.